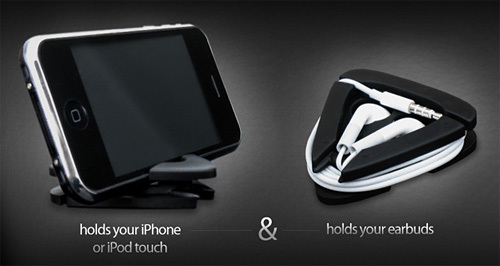 iANGLE iPhone Stand/Headphone Wrap Does Double Duty | OhGizmo! By Andrew Liszewski on 05/12/10 • Leave a comment! I can’t say I’ve ever had an issue propping up my iPhone that wasn’t easily solved with a pile of laundry, but if you can’t live without some engineered means of holding up your iPhone or iPod Touch then the iANGLE seems like a reasonable non-unitasking solution. When not in use for watching movies it doubles as a simple earbud wrap meaning you always have an excuse for carrying it with you. And since it’s made from plastic, it costs a very reasonable $9.99.